I’ve been blessed with magical people surrounding me my entire life. I honestly believe that in being a thoughtful, loving person the universe has brought me the most wonderful people on the planet to adore. One of my favorites is Keltie. Keltie is the epitome of a hustler. Next to Kelt I look asleep. We’ve danced in the same line as Rockettes, auditioned side by side, had our make-up chairs next to each other for work, basically she is #4 on my speed dial and her picture is framed in my kitchen. When I needed to recharge my batteries I lived with her for 2 months in LA. I would watch her morning to night work on several projects constantly manifesting…. creating thoughts into reality. One Valentine’s Day she called me in tears bailing her eyes out about her current famous boyfriend cheating on her. A week later we were moving to Vegas to start a new show. I watched her try to understand what had become of her perfect little life. But Keltie being the divine spirit that she is decided to turn this terrible scenario into a story of triumph.One day she looked me square in the face and said she couldn’t come to dinner with me because she was working on her book….this was the first I had heard of it and thought “My God. She’s gonna be an author now.” And she is. 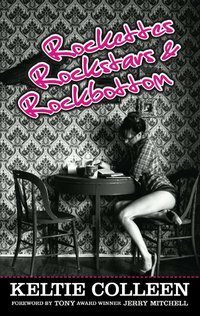 She just published her first book Rockettes, Rockstars to Rockbottom. The book is available on exclusively on: http://www.deadxstop.com. It is heartfelt, complicated, hopeful, tragic, yet honest book, which if you read closely you can even find some Loftiss weaved into the text. 🙂 Check out her website for book tour dates and new updates: www.keltiecolleendance.com. I am, once again, so proud of her. *If you wish to be motivated then buy this book and be inspired by the one who inspires me daily. Tags: Keltie Colleen. Bookmark the permalink.